Our goal is to provide a safe, fun, and structured riding environment tailored to each individual rider. 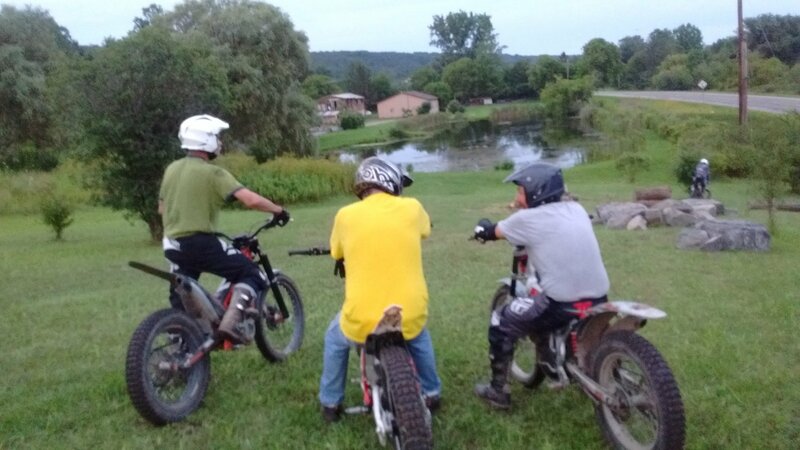 Our unique riding area located at the Tryals Shop, in Locke N.Y., offers challenges for every skill level rider, with a variety of terrain options available. Hills, off-camber turns, logs of various sizes, rock climbs, steps, and ledges. Our training sections are purposely built for teaching specific techniques, and each rider receives individual attention, with section design set at a learning level slightly beyond their present riding capabilities. Improving section problem-solving strategies and concentration. Development of proper section structure to promote positive learning habits. Enforcement of good riding habits. Bring your bike (get one on one instruction) $25.00 per hour. Borrow a bike from us (get one on one instruction) $50.00 per hour. Adult or Youth Bike Available. Mike has done many trials schools and has more than 40 years of experience as an expert trials rider. He has participated on the Trials de Nations team as team captain on four occasions and also has attended almost every US world round since 1992. Mike has been a minder several times for many of the top world riders and also has earned a senior national championship and many regional championships. Aaron is an excellent instructor and has been part of the Tryals Shop since his second day on the planet. He now has 17 years riding experience with many years as an Expert Class rider.